Another key area ASCON GmbH focuses on besides material management is consulting services. 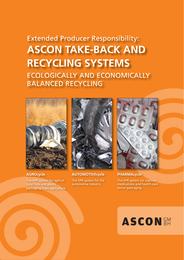 ASCON advises its customers on the development and realisation of collection, sorting and recycling systems, the development of international markets for innovative sorting and treatment systems and also on the implementation of environmental laws and the launch of innovative new packaging products, for example. We also prepare feasibility studies for collection and recycling systems and develop data-based material flow systems. With more than 25 years of experience in this market, the ASCON team always achieves excellent results. International experience is another ASCON staff trademark. We are involved in consultancy projects that focus on the implementation of sustainable waste management systems in Bahrain, in Jordan/Amman and in Iraq/Kurdistan/Erbil. In cooperation with various South American chambers of foreign trade, we advise companies on the implementation of EPR and a circular economy and establish platforms for companies that export to Europe and have to comply with the respective local laws on packaging, batteries and WEEE. ASCON GmbH has prepared a study on the potential implementation of a dual system in Thailand for the KfW Group, and the Qatari royal family Al Thani commissioned ASCON with the planning and implementation of a modern waste collection and recycling system for Qatar. The Deutsche Gesellschaft für Internationale Zusammenarbeit (GIZ) GmbH, a provider of international cooperation services for sustainable development and international education work, also relies on ASCON's expertise; ASCON's CEO Sascha Schuh was asked to hold a comprehensive workshop on waste and recycling for GIZ in Uzbekistan. Thanks to our many years of national and international experience, in-depth market knowledge and creative and responsible consulting services, we guarantee our customers comprehensive and innovative results. We focus on the customer and discuss the issues at hand and the solution approaches from various perspectives. It is therefore not surprising that we can count national and international companies, local councils and institutions amongst our customers.